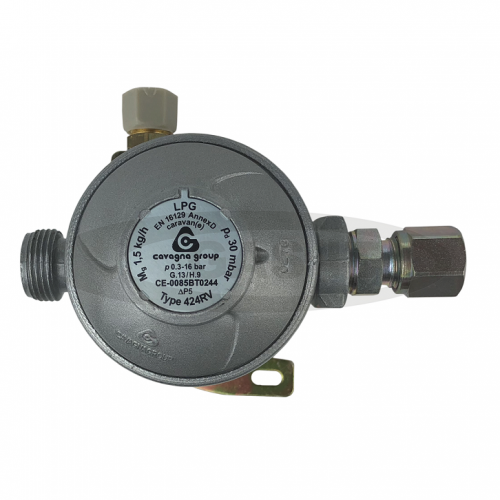 gas it, gi-reg-001- regulator, reg, 30mbr - GAS IT Leisure Gas Bottles, Gas Cylincers and Gas Tanks - Catering, Motorhome, Campervan, Caravan, Farrier and Road Repair Refillable Gas Solutions. GAS IT's Micro 30mb Motorhome and Caravan Regulator from Cavagna with Straight outlet has a beautiful small, compact footprint and comes with a 8mm outlet already fitted, and a W20 ( pigtail type ) fitting on the inlet. It also have the required Leak test point already fitted. For fitting in a restrictive space like when replacing less reliable regulators, we also have a angled version again with 8mm or 10mm fitting already on there. See our webshop for more info.